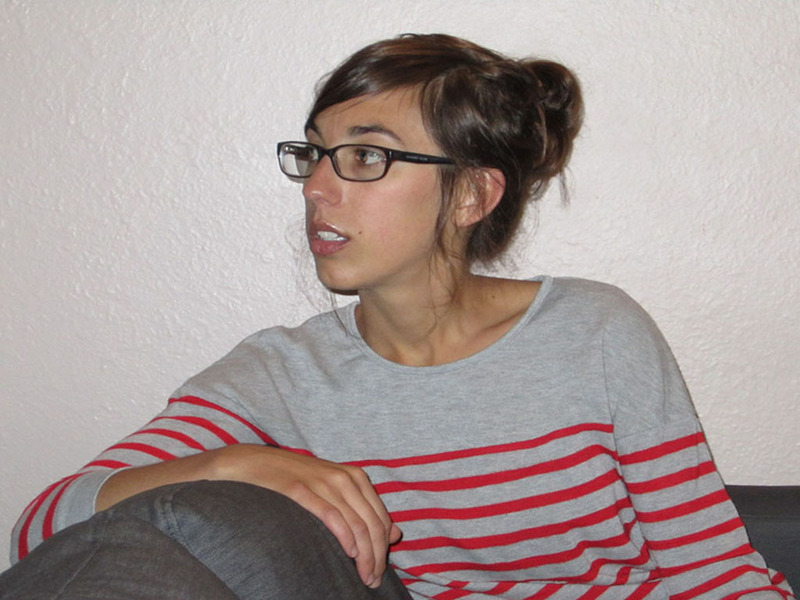 Lindsey Drager has recent work published in The Pinch, Caketrain, Gulf Coast, Kenyon Review Online, Zone 3, West Branch Wired, and elsewhere. She serves as assistant editor of the Denver Quarterly and is a PhD candidate at the University of Denver, where she is at work on a project that investigates the intersections of museum studies, disability studies, and narrative theory. Black Warrior Review: You’ve said that you are working on a project that explores “the intersections of museum studies, disability studies, and narrative theory.” It seems like “Her Exhibit is Curated” is very much of that project. Can you expand a little bit on what that intersection involves and how it appears in your writing? Lindsey Drager: Gladly! “Her Exhibit is Curated” started when I was experimenting with the question of how to tell a story that is rendered visually, an issue I have been grappling with for a very long time. At the core, I think all of my writing projects have been about the ethics of satiating curiosity—the question of who gets to tell which story and from where does that power derive. These are questions that live at the center of disability studies, museology, and narrative theory and part of my uptake is to tease out—through fiction, and often through satire—various answers. BWR: What is it that led you to this project? LD: I was researching narratives of disability for a project I’ve since completed and had come across an article about onomatopoeia in American Sign Language–poetry and blind photographers—in other words, artists working to challenge the very status of what it means to capture an image or transcribe sound. A longtime fascination with the politics of human exhibition, particularly in the case of the freak shows that toured the U.S. from 1860–1940, led me to the institution of the museum. BWR: “Her Exhibit” relies on a formal constraint – it is a monologue, almost, delivered by a museum curator giving a tour of an exhibit. Did you start out with this form in mind, or was it something that arose naturally out of the piece? LD: I did have curation as a narrative device in mind when I started the piece, but the piece really started after I nailed down the first line. I was imagining what a yawn, a phenomenon that lives temporally, like narrative, would look like spatially, as an image. I mean, a static yawn could look just like a scream. So that first line—“Here we have a yawn.”—attempts to explore how a curated exhibit both contributes to our understanding of what we are seeing, while also limiting the ambiguities that are inherent in evocative art. The original title was “The Exhibit is Curated,” but this felt almost too cold and authoritative. When I introduced the pronoun, the curator’s explication became at once exploitive and eerie, as the question of just what is her exhibit surfaced and provided, at least during the writing process, the story’s driving force. BWR: “Her Exhibit is Curated” contains markers that point to it being part of a world that is not our own – we have specific terms like “pain conferences,” “scar scholars,” “Arbiters of Safety” and “the Magistrate of Body Dismemberment.” How much world-building, or developing an environment, do you find you do in writing a piece like this? LD: That’s a fabulous question, because I think every story requires a degree of world building, even if the story can be characterized as realism. For this piece, I wanted to estrange the audience enough to signal that this world is one that hovers at the border of our own, and that meant creating terminology and institutions that felt at once recognizable and also defamiliar—a world where Arbiters of Safety could be medical professionals or the armed forces or our parents. Several of the terms used in this piece have launched other stories that employ various modes of spoken narrative, too; “Her Exhibit is Curated” mentions the Touch Wars, the title of a tale I ended up writing after “Her Exhibit”, that includes the subtitle “A Father’s Bedtime Story to His Daughter, Age Six.” While the attempt is to permit each of these narratives the space to live independently, when collected a more exhaustive—and creepier—story surfaces. BWR: It seems like being a writer involves a lot of “thanks but no thanks” responses. How do you deal with rejections? LD: Virginia Woolf said in her diary, “Writing is the profound pleasure and being read the superficial.” I have found that you have to love to write, and you have to like being published—for me, that is the first step in coping with rejection. BWR: What are some things you enjoy doing when you aren’t writing? LD: Aside from editing and reading, both of which I enjoy very much but are in some ways ventures reciprocal to writing, I work on my vintage camera collection and study the history of fonts, an obsession that developed when I was doing book layout for Dalkey Archive Press. Since moving to Denver I’ve been trying to learn about beer. And I love live hockey, which was a staple in my childhood, having been raised in Michigan. BWR: What are your reading guilty pleasures? LD: I don’t exactly know that I would qualify it as guilty, but I do spend time every summer re-reading my favorite young adult novel, Louise Fitzhugh’s 1964 Harriet the Spy. While I’d like to say Melville’s Pierre or Calvino’s if on a winter’s night a traveler or even Lewis Caroll’s Through The Looking Glass is the book that changed my life and launched me onto a trajectory toward writing, the truth is a lot less sexier. Nevertheless, Harriet the Spy is one of those girl-investigates-world-to-learn-it’s-flawed novels, which was hugely important to me when I was eight. It’s a story about learning our parents aren’t heroes and coping with menstruation and coming to understand that some of life’s marvels and wonders should be left written. Also, and totally unrelated (in fact, kind of fully contradictory), I love reading rather poorly conceived true crime novels about serial killers. Because that kind of mind is just so beyond my comprehension, and because these books are so rhetorically flawed, I do not think I will ever grow tired of reading them. BWR: What else are you working on right now? LD: I am thrilled to report that I am currently conducting the last edits for a novel, The Sorrow Proper, which will come out in April 2015 from Dzanc Books. In addition to the museum project, I’m also plugging away on a book-length essay about, among other things, transgender youth and glass in nature and the history of the umbrella. To read Lindsey Drager’s work and more, pick up a copy of Issue 41.1 or order a subscription from our online store.